How can fish be exposed to HABs? Direct contact with cyanobacteria and associated toxins (cyanotoxins) in the water. Ingestion of cyanobacteria and cyanotoxins through their diet. What are signs of possible cyanobacterial toxin poisoning in fish? Fish may become sick or die from exposure to cyanotoxins. Fish may also be impacted from low dissolved oxygen associated with decaying algal material. How can I report fish kills? Fish kills that may be related to a suspect HAB should be reported through the HAB Portal bloom incident form. 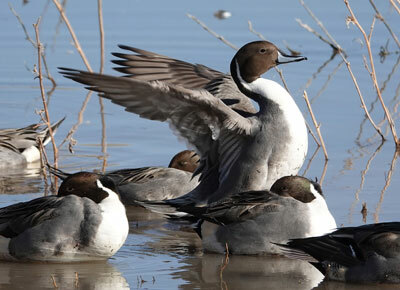 Once reported, a state agency (OEHHA) will inform the California Department of Fish and Wildlife (CDFW) and assist in collecting the relevant data for the CDFW Mortality Report. What are Golden Algae Blooms? Southern California is experiencing an increase in fish kills due to the occurrence of golden algae blooms. Golden algae (Prymnesium), are often found in estuaries and inland saline (salty) waterbodies. One species of golden algae causes impacts to fish and bivalves (e.g. clams, oysters) since the toxin it produces injures their gills and causes illness and death. For more information on Golden Algae refer to other resources, such as information provided by the US Geological Survey (USGS)). How can wildlife be exposed to HABs? Animals receive much higher exposure to cyanotoxins compared to people because they drink scummy or discolored water, eat algal material, and lick algae stuck in their fur after swimming. Animals are especially vulnerable to cyanotoxin poisoning due to their high exposure levels. Animals can be at risk even when blooms are not visible. Benthic blooms commonly poison animals that eat algal material growing in the shallows, floating as mats on the surface, or in algal accumulations on the shore. 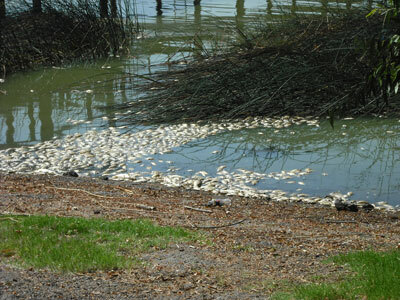 Such poisonings typically occur at fast or slow moving rivers, streams, and other areas prone to benthic cyanobacteria. How can I report sick or dead wildlife? Sick or dead wildlife that may be related to a suspect HAB should be reported through the HAB Portal bloom incident form. Once reported, a state agency (OEHHA) will inform the California Department of Fish and Wildlife (CDFW) and assist in collecting the relevant data for the CDFW Mortality Report. The California Environmental Health Tracking Program (CEHTP) at the California Department of Public Health (CDPH) or the Office of Environmental Health Hazard Assessment (OEHHA) will contact the reporting party to request additional health information on the affected animals. CDPH is implementing California’s HAB-related human and animal illness reporting to the Centers for Disease Control and Prevention (CDC) One Health Harmful Algal Bloom System (OHHABS).